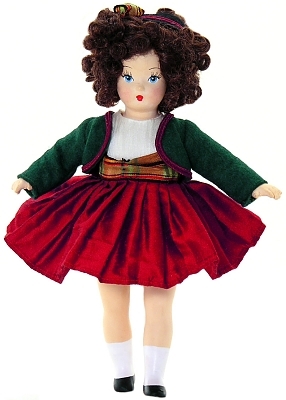 Tiny Betty Christmas is a joy to behold in a red skirt and dark green felt jacket that has red trim worn over a white ribbed blouse. The skirt has a checked waistband that matches the hair band in her dark curly hair. White undies, painted white socks and black shoes completes Tiny Betty Christmas ensemble and goes beautifully with her blue eyes. Retired item - available for limited time.